Here is Burne Hogarth's anatomically dynamic Tarzan cast in bronze! Burroughs' jungle hero is depicted in an African river greeting N'kima the monkey in the tree branches above. 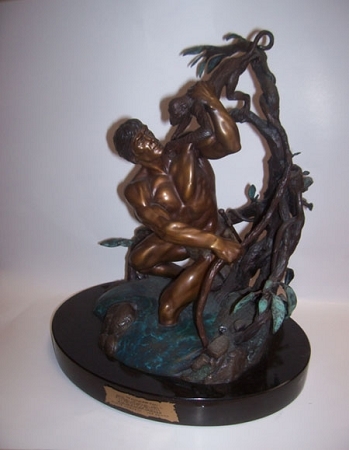 A magnificent sculpture that is a must for any Tarzan collector. This item is extremely heavy at 30 pounds and, therefore, requires additional postage and insurance.